WHEN England emerged triumphant from the Women’s Rugby World Cup, there were extra celebrations going on in South Gloucestershire. For among the victorious team were Staple Hill vet Sophie Hemming and former Bromley Heath schoolgirl Amber Reed. England beat Canada 21-9 at the Jean-Bouin Stadium in Paris to win the Women’s Rugby World Cup for the first time in 20 years. 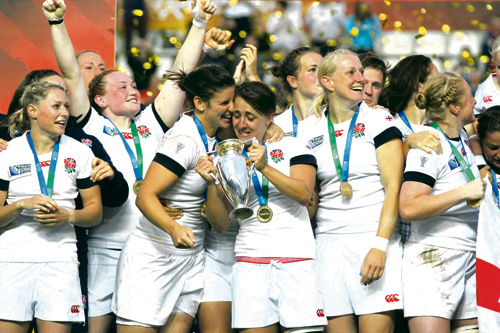 The much-talked about game, on August 17, is being referred to as a turning point in women’s rugby, with many saying the England performance during the tournament has smashed stereotypes and put women’s sport firmly on the map. Both Sophie and Amber say they are still coming to terms with the enormity of the win and that they have been amazed at the huge positive reaction they have received from both the public and the media. The team has even received messages of congratulations from Prince Harry and the Prime Minister. “It’s a bit overwhelming really,” said 34-year-old prop Sophie, who works as a vet at Avenue Veterinary Centre in Staple Hill. Amber, 23, who grew up in Fishponds where her mum still lives, shares a similar feeling. “It’s still a bit unreal,” she said. The dedication and perseverance shown by the team - England had lost in the last three World Cup finals - is even more the surprising because the women’s game, unlike the men’s, is yet to turn professional. It means training and matches take place alongside their day jobs. Sophie, who lives in Frampton Cotterell, settled in South Gloucestershire from her hometown of Norfolk after studying at Bristol University. 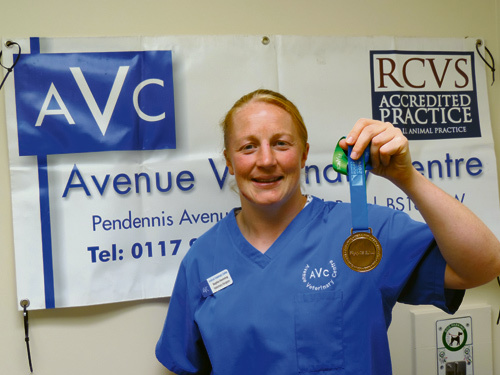 She qualified as a vet in 2004 and has been at Avenue vets ever since. “The practice has been fantastic in supporting me and helping me juggle the demands of on-call rotas and time off so I can attend training camps and play the game,” she said. The situation is slightly different for Amber, although none the less demanding. She is studying a graduate sports coach qualification in Bloxham, north of Oxford, and will go on to start teacher training. Her ambition lies with becoming a PE teacher at secondary school but she hopes to stay with the England squad for many years to come. “School is Monday to Saturday and I play rugby on a Sunday so it’s hard to fit much else in,” she said. Despite studying more than 70 miles away, Amber has pledged to continue playing with Bristol Ladies in the RFC Women’s Premiership, the team Sophie also plays for. The England team’s performance during the cup has raised the question of whether the sport should turn professional. 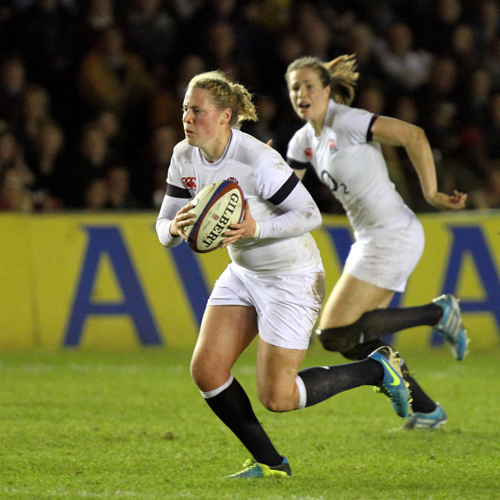 “The World Cup has shown what a great standard of rugby we play,” said Sophie. “There becomes a limit to how much training you can do and how much you can recover when you’ve got to fit in full-time jobs. I think it’s something that will happen in the future. I don’t know whether that will be in my playing career but it’s certainly something that I don’t think is too far away. While the girls were revelling in their win, their friends and families, some of whom had travelled to Paris for the game, were no less overjoyed. “My family are really proud,” said Amber. Sophie, who gained her first England cap in the Six Nations in February 2007 and has now represented her country an incredible 71 times, said she has received brilliant support from her family. “My family are just over the moon. My brother is in London and my sister has just moved out to America. She used to live in Twickenham and came to every game so it was tough for her not being around. She actually gave birth to a little girl during the tournament so she couldn’t come over. Back in Bristol and glued to their TV sets for the games were Sophie’s colleagues at Avenue Vets, who threw a surprise party in her honour during her first day back to work. Sophie said it would now be a time to reflect on her future. “It’s going to be a case of digesting the win and giving it time to think about whether I carry on playing rugby,” she said. “I’m one of the older members of the squad and the game requires so much time and effort including getting up at 5.30am to train before work, then training again in the evening. It’s been fantastic and has ultimately won me a World Cup medal but there is a limit to how long I can carry that on for. Amber, who received her first England cap in November 2012 and now has 18 caps under her belt, said rugby would be very much part of her future. Amber’s mum Denise said there was tremendous excitement in Fishponds and Bromley Heath where Amber is known to so many people. “Watching the team’s success with good friends has been a moment I will always treasure. “Amber has been so dedicated to her rugby and I am so proud of her being selected for the World Cup and being part of a world class team.